Jamaat-Shibir men attacked law enforcers guarding a BNP rally in Dhaka yesterday with homemade bombs and forced them to retaliate, spoiling the rally and resulting in a clash that left around 70 people injured. Following the clash, the BNP called for a nationwide dawn-to-dusk hartal today in protest against what it said attacks by armed ruling party men and police brutality. The BNP-led 18 party opposition alliance would enforce the hartal. The BNP rally was going on peacefully in front of its Nayapaltan office yesterday afternoon but around 4:30pm, 200-300 activists of Jamaat-e-Islami and student body Islami Chhatra Shibir gathered on Nightingale Lane, which was at the end of the BNP rally, witnesses and police said. Following the arrest of a Shibir man there, several homemade bombs were exploded near policemen, forcing the law enforcers to retaliate. Police started firing rubber bullets and tear gas canisters from Scout Bhaban and Nightingale Lane intersection and moved towards the rally. The police retaliation left many injured. Witnesses said police fired at least 60 rubber bullets and several teargas shells in the hour-long clash in and around Naya Paltan area. The BNP activists were initially frightened by the explosions and the hue and cry that followed. They later resorted to vandalism, torching of vehicles and pelted law enforcers with brick chips near the BNP office. The top leaders of BNP and its associate organisations took shelter inside the BNP office during the clash. 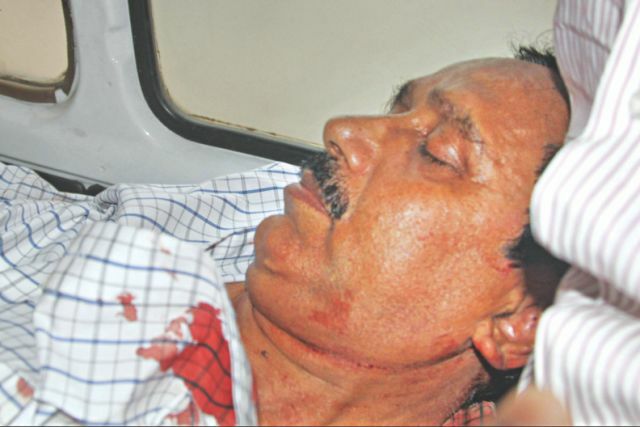 However, around 65 BNP men, including its standing committee member Nazrul Islam Khan, BNP city unit member secretary Abdus Salam and at least four photojournalists suffered rubber bullet injuries. Meanwhile, the Jamaat-Shibir men retreated whilst hurling homemade bombs at policemen and terrorising Shantinagar, Fakirerpool, Kakrail and Rajarbagh areas. Around 6:00pm yesterday, BNP acting secretary general Mirza Fakhrul Islam Alamgir at a press conference called for a hartal. He claimed that 1,500 BNP leaders and activists were injured in the incident. Almost immediately after the BNP hartal was called, the Jamaat-e-Islami, whose top leaders are behind bars in connection with committing crimes against humanity, issued a press statement calling for a nationwide hartal today. After a meeting of the opposition alliance last night, National Democratic Party chief Shawkat Hossain Nilu told The Daily Star that today’s hartal would be enforced by the 18-party alliance, not just BNP and Jamaat. Mehedi Hasan, additional deputy commissioner of Dhaka Metropolitan Police (Motijheel), told reporters that the Jamaat-Shibir activists joined the tail end of the BNP rally at Nightingale Lane to carry out criminal activities. “We had to swing into action to disperse the Jamaat-Shibir men after they exploded cocktails,” he said. He said they had been warning the BNP high-ups since morning that Jamaat-Shibir activists might carry out destructive activities at their rally. “But they didn’t pay heed to us,” he said. 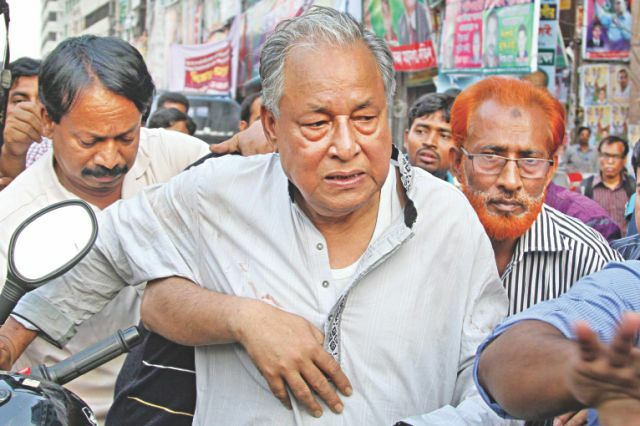 Injured BNP standing committee member Nazrul Islam Khan, while going to hospital for treatment, alleged that government-backed people exploded the homemade bombs as part of a conspiracy to foil their rally. He put down the claim made by Mehedi. Jamaat-Shibir and BNP men last night vandalised and torched at least 50 vehicles across the country. Hartal supporters also attempted to set fire to a train heading for Mymensingh at Gafargaon Rail Station late last night. Hartal supporters attacked police in Santhia Bazar area in Pabna, leaving at least four policemen injured, including two sub-inspectors. In the capital, hartal supporters torched at least eight vehicles, three near Bijoy Sarani, one at Bangabazar, one at Mirpur-2, one at Bangshal, one at Bijoy Nagar, and one at Nayapaltan. They also vandalised at least 15 vehicles in the capital. Bangladesh Border Guards had been deployed in the capital since yesterday evening. There had been reports of several explosions of homemade bombs in the capital. Hartal supporters also vandalised at least 10 buses at Gazipur Bus Terminal after a clash between activists of Awami League and BNP. They also torched two buses in the district. Supporters of BNP-Jamaat torched a bus on Dhaka-Chittagong highway in Mohammad Ali Bazar area of Feni around 9:15pm. They also hurled brick chips at several vehicles on the highway. Meanwhile, the local administration in Bogra imposed a ban on all public gatherings at six upazilas, including Bogra municipal area, for an indefinite period to avert untoward incidents. This report is not correct. Awami League workers are throwing those cocktails to make it look like others are doing it.